Workshopshed: Russ is a friend of mine from since college, we spent many hours at the student TV studio and then later worked together installing software around the globe. Last month, I got together with Russ and another friend Richard to learn how to use woodworking routers with trainer Richard Morley. 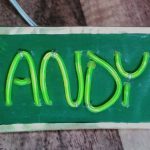 Russ has since been using and improving his new skills on his latest project. Russ Casey: Recently, I completed a gaming chair project that was great fun – attaching a leather car seat to a base frame and installing bass shakers, joystick, throttle, speakers and other good stuff in the cabinet. I built the thing with Ikea flat packs and a circular saw, and while this did produce a good result it highlighted just how limited I was with my woodworking skills and techniques. From this I developed a desire to get a router and learn how to use it, so when a friend posted on Facebook about a routing course at a local hardware store I didn’t need much encouragement to join in. The course was run by youtube routing sensation Richard Morley, and after a full day of learning and a transaction in the store and I was ready to embark on my next project. 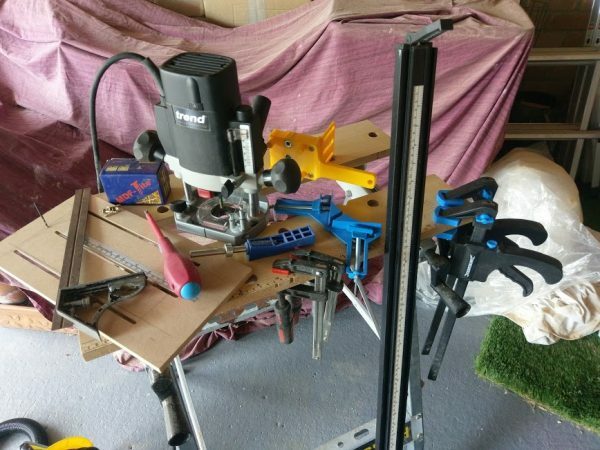 This time I would not be relying on Ikea to make my right angles – I was equipped with a new Trend T5 router, some new clamps and a very nice combined straight edge/clampy thing. The idea for the next project soon emerged. 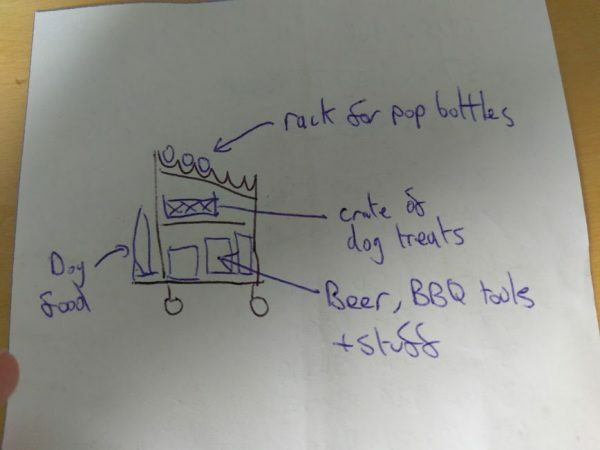 Competing ideas included a campervan build (a severe case of trying to run before mastering standing upright), a box for the dog’s toys (too simple), and a third version of the gaming chair before the perfect project came to me with a –sadly literal – bump on the head. 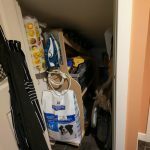 In our kitchen we have an under-stairs cupboard that we use to store the vacuum, iron, dog food, bottles of pop, cans of beer, barbeque tools and other typical oh-just-put-that-under-the-stairs-type-stuff. It was while reaching past the vacuum and over the crate of dog treats to grab a beer from the shelves at the back of the cupboard that I clonked my head and inspiration came to me… I would use my new found routing skills to create a storage trolley for under the stairs that would hold the big bag of dog food, the big crate of doggy goodies, bottles of pop, cans of beer, barbeque tools and other stuff. It would provide easy access to these items by raising them off the floor, and provide further storage. 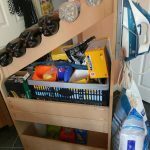 The trolley would then easily roll out of the cupboard to provide easy access to its furthest reaches, which is the domain of ‘handy’ stuff that we never seem to use like bird seed and the more esoteric vacuum cleaner tools. I carefully created a BAD* diagram and set about obtaining some MDF. *Biro Aided Design, a similar technique to CAD which eschews accuracy for just getting the job done. I selected 15mm Oak veneered chipboard as my intended final material, with which I could use T trim edging of the sort that is popular in campervan furniture. This would provide a nice and hard wearing edging that would act as a ‘bumper’ around the base and also do a decent job of gripping the bottles on the rack. Cutting the groove for the edging would be a simple job for the router too. However, I expected that some development of the design would be required and so chose to create a prototype out of 15mm unfinished MDF. I also picked up a sheet of 6mm MDF to make tools and templates with. After some careful clamping the circular saw made short work of cutting the 15mm panel into rectangular pieces for the base, front, back, shelf and some side braces. I used a dowelling jig to attach the front and back to the base, securing the joints with pocket holes created with a kreg pocket hole jig. It took a bit of experimentation to get the pocket hole joints working well, but with some MDF screws and the right positioning of the jig I got reliably good results. The rest of the joints were all done with pocket holes for the prototype. Once the basic structure of the trolley was ready, I attached my castors and tested the fit. 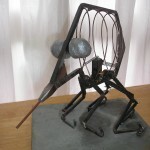 It became clear that the castors were not up to the job – they were very noisy and the trolley was difficult to move. The fix for this was a set of bigger castors, which then meant I needed to reduce the height of the front and back. Once all that was out of the way, it was routing time! Routers are exceptional tools for working wood – they are excellent for creating perfectly straight cuts, but they can also cut grooves, edge profiles, and – importantly for me – circles and curves. To create the bottle rack I would clearly need this. Out of the box, the router came with a trammel – a sharp point mounted on a rod that attaches to the router’s base. This does a reasonable job of cutting circles, but it isn’t the best as there is a good risk of the trammel’s point moving mid cut. Unfortunately the trammel could not cut a circle with a small enough radius for what I needed due to the size of the router base. To fix all this, a circle cutting jig was needed – youtube to the rescue! 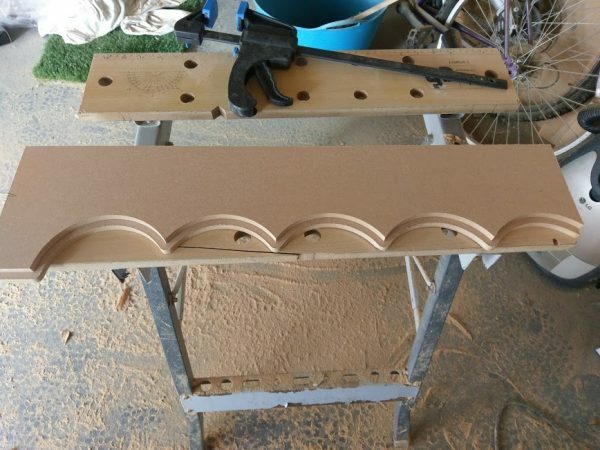 It was surprisingly easy to create a jig by cutting two parallel grooves of the right separation, and then limiting the depth of the cutter and routing out the rebates on one side. After that I simply attached the router to these slots loosely and then cut the central slot. For the pin I used a 2mm drill bit, which I didn’t bother gluing into place – it was useful to be able to use the bit to drill the centre points in my template. As a final flourish, I used a stick-on measuring tape so that I could set the radius of the cut easily. Once I had a circle cutting jig, I could use it to create a template, and then cut around that using a guide bush to make the bottle rack. Geometry time! I was using a 6mm cutter and a 20mm guide bush, so there would be a 7mm gap between the guide bush and the cutter’s edge. (20-6)/2=7. This means my template needs to have 60mm radius arcs. Below is my circle cutting jig and the outer template after making the first arc cuts, and then the outer template and inner template together. This photo clearly shows how the gap between the guide bush and cutter create a radius over the apexes of the arcs. The templates do not need to run the full length of the finished workpiece as they can be repositioned. After a trial fit it was clear that I could remove quite a bit of material from the front and back panels, which would look good and also improve access to the contents of the shelf. The bottle rack rails would need to be mounted inboard anyway to support the straight edges of the bottles, and so the end panels could narrow from their original 375mm width to around half that, with a 120mm reduction on the right side and a 60mm reduction on the left. Cutting a smooth S bend required more geometry – yay! I started out with an oversized piece and drew the shape that I wanted the workpiece to be. This would have a smooth ‘S’ shape edge that would curve away from the existing edge then curve back to be parallel with a 120mm separation. I drew two parallel lines on my template 120mm apart, then added a perpendicular line where the curve would start. I measured a diagonal of 240mm to create a rectangle. Two arcs of 120mm radius from opposite corners of the rectangle provided me with the workpiece line. From this I needed my template line – there is a 7mm gap between the guide bush and the cutter’s edge, so this meant a 113mm radius for the start of the bend in from the edge, and a 127mm radius for the bend back to the parallel. I also needed to add some straight lines 7mm offset from the workpiece lines. After a similar job on the other edge of the template, I was ready to start cutting. I cut the larger concave arcs first, as the origin points of these were in scrap that would be removed by later cuts. I then cut all the straight lines, before finally using the circle cutter again for the convex cuts. I then notched the edges to make it easy to align to round off the top corners. 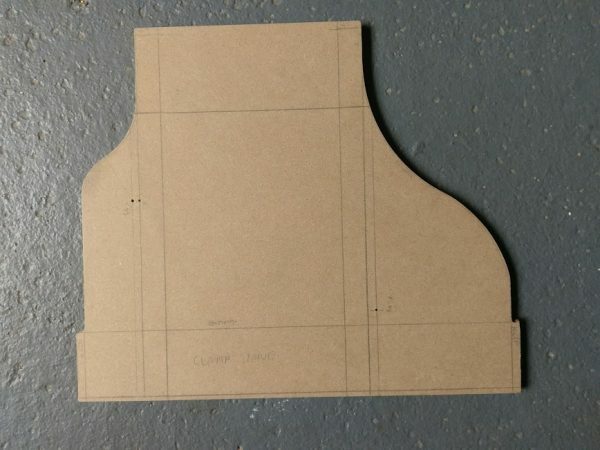 Behold – the side panel template! After spending hours marking out and cutting the template, cutting the actual panels was the work of minutes – just clamp the template in the right spot and go. A quick bit of final assembly, and here is the completed prototype. You can see how the shape of the rack has been refined again thanks to the intermediate template, with tighter arcs that accept the bottles neatly and a smoother radius curve between them. The excess of storage on the lower shelf surpasses expectations, and may mean we can empty out a kitchen cupboard. I’m going to leave it for a few weeks before considering a final build, so we get time to live with the prototype and consider tweaks. I may adjust the dimensions to make the whole thing a little narrower, and possibly extend the length of the base so that I can add a radius to the rear corner – that would make it easier to position properly and stop it from scraping the skirting board. 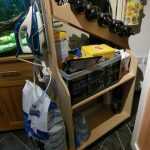 The bottle rack positioning may need a tweak too as the carrier bag holder you can see on the wall has a tendency to knock the bottles off when pulling the trolley out. I also considered adding a bungee to the front to help retain the big sack of dog food, but it seems to be stable enough without it. Trend T5 router with 6mm straight cutter. You can see the black guide bush attached to the base, and the dust extraction fitting extending behind – dust extraction is really important with routeing. 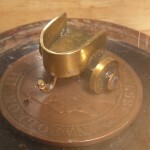 Straight edge clamp – this was excellent for the straight cuts, of which there were many. 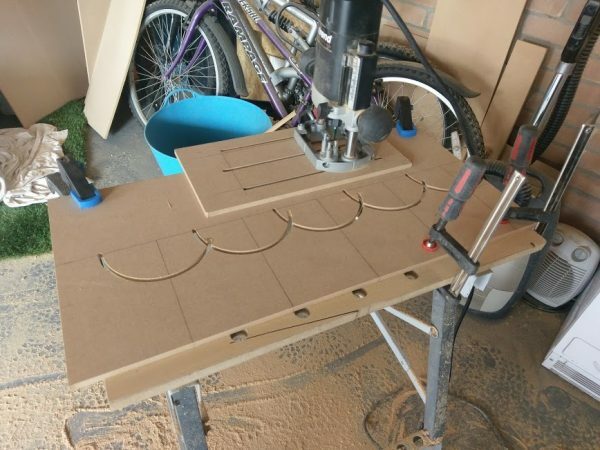 Workshopshed: Thanks Russ for an excellent write up and showing what it’s possible to do with a router and some ingenuity. Great article. Can you get your racing car in there? I just realised I never updated this article after completing the project. The finished trolley was made out of 15mm oak effect chipboard, and has been in service a few months. I removed the bottle rack, as it made the trolley a bit too top heavy which made it prone to toppling, and we found that the improved access to the top shelf of the trolley was a big improvement. I also made a jig to round off the corners in a uniform way, and rounded the tops and all four corners of the base. The edges are trimmed in T-channel edging, which required me to rout a groove into all the exposed edges. 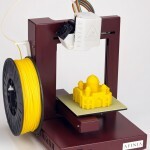 This worked really well – it was simple to do and produced a great result. The T-trim acts as a great bumper around the base too. Another improvement was the way the shelf is braced – I cut some very precise channels into the sides and back. These are exactly as wide as the board is thick, and so the shelf slots in neatly with no obvious visible supports.